There has been talk recently of a group based in Kilkenny who have a method for putting properties beyond the reach of banks. According to papers even Bill Cullen is part of it. Upon hearing about it and how it used a ‘trust’ structure to put property out of harms way we initially thought it referred to [glossary id=’6991′ slug=’unencumbered’ /] properties; but apparently it works for all properties including those for which there is a [glossary id=’6898′ slug=’mortgage’ /] secured against the home according to its promoters. We were asked by a client to attend one of the presentations the group held, it was in Kilkenny in the back room of the Kilford Arms and was free of charge. The two people who talked at the meeting were a man named Noel Brophy and another named David Walsh, the first was a builder in the USA who returned home and had since gotten into disagreement with lenders, the other a man who was fighting banks but for whom there was no background information beyond that. The breakdown they gave is as follows. The cost to join is €250.00 which consists of €170.00 which is their fee plus €80.00 in vouched expenses. The vouched expenses are the costs they incur in obtaining two documents for you from either the land registry or the registry of deeds and it consists of two €40.00 charges for two of the following documents. The first is either the certified copy of the folio (land registry) or certified copy of memorial relating to the conveyance (registry of deeds) and the second is for a certified copy of instrument or schedule from the solicitor who did the conveyance. Once you have these they have you set up a ‘private trust in private’ by creating a Court of Record in front of a Notary (this may not be how things actually work, this is just what they are telling people). In this process you then prove ownership of the property via the documents obtained from the various registries. They say that the bank don’t show as owner because they only have a charge, and that once you are shown as owner and give an ID that the notary stamps this and it can’t be overturned even by the Supreme Court. The value of the property is placed as zero as only the folio number is going into the trust. After that you get a 999 year lease from the trust which means you pay a nominal rent of €100 a year for the use of the property. They say that other than the grantor, trustee and beneficiary that nobody has the right to enter this trust for any reason. Charlie Allen (who is the key-man of it all) gets power of attorney to administer the trust. In short, he can do with the property as he sees fit, but they say that in practice what he does is ‘remove the debt’ from the property because the bank can no longer prove it exists in connection with the person via the vehicle just described. This happens (they say) within about three months. The charging structure is as described for a family home, on investment portfolios it’s 10% of the value of the estate, on people in receivership they charge 50%. They claim there is €1,000,000,000 of property gone in, this could mean (taking that the main attraction is with investors, some of whom are in receivership) that there is about €100,000,000 of potential real estate being transferred to the promoters which is an unusual brand of philanthropy given that the ‘pool of money’ is mean to be used to defend cases. Noel Brophy then went on to give an incorrect version of how accounting in banks work, he did mention fractional reserve banking and some things which had tinges of ‘real life’ systems, but his description of debits and credits was wrong, that’s not open for debate, the rules have existed for over 600 years. The ultimate end is that they claim they can remove the banks ability to force a liability on you, and that you can’t bring a private trust in private to court, ergo the bank can’t chase you any more through the courts, as well as stating that the only people who can open this trust are the people in it. All paperwork now goes through a company in Kilkenny, I asked where the company was, for the contact details and any other information but it was not supplied. Upon give over power of attorney you relinquish the right to defend yourself from the banks because you are now only a tenant, you don’t have to pay property tax because you are a tenant. They also said that banks now have an ‘anti-trust’ clause stitched into loan offers and that there is no mentioned of a ‘mortgage’ any more, rather it’s an extended line of credit. That’s it in a nutshell. Now I’ll give some concerns about this set up and why we are advising all of our clients to steer clear of this group. 1. They are not regulated by anybody, they are doing things that you might normally require a solicitor to do but without being solicitors, without any professional indemnity and without having the likes of the law society as an overseer. They are also not regulated by the Central Bank even though they are giving advice on things that have deep financial implications. While debt advice is an unregulated activity, many firms offering it are regulated and that one side of their operations has that it would often mean they carry over best practice into the other activities and they are also required to ensure the client is treated fair and understands that the service is not regulated. 2. If only the folio number goes in then they aren’t ‘taking away your debt’ they are simply making it that the title might have a blip on it that deters buyers or which means it can’t be easily conveyed. They said it meant two properties couldn’t be sold at an auction, I rang the named auctioneer who told me that it wasn’t a case that ‘they couldn’t be sold’ they were merely withdrawn and that’s a different thing. They didn’t ‘scupper the auction’ they may have just created a delay in the process. What they also don’t tell people is that this could be reversed. 3. If it only takes three months to ‘remove the debt’ and there are 1,000 people in this and it existed for the last two years then why are there only three success stories? That’s a 0.003% success rate, you could probably achieve the same result by doing Part 4 Data requests and finding that there was paperwork out of order in the banks – in fact, your success rate would likely be higher using that approach. 4. If you rent a property worth a large sum for €100 a year is there any Benefit in Kind due? Getting something for less than it’s market value could confer some kind of tax liability (potentially). 5. If you are intentionally evading creditors and create a gain that doesn’t incur tax but you haven’t outlined the scheme to Revenue then you could be guilty of an offence and there are also issues surrounding Anti-money laundering & financing of terrorism Act (tax evasion clauses). 6. If you have a property with a mortgage of €500,000 and it’s magically turned into zero is it a capital acquisition when you are the beneficiary? If so what is the rate of tax? As you are not gaining a family home (you become a tenant) is there a potential liability there? 7. Does the trust require disbursement? (an annual release of a certain amount of the assets held). 8. Can it be reversed if challenged? The fact that banks haven’t tried to challenge doesn’t mean there ‘is no challenge’ it probably means they have gone after other low hanging fruit and will put a case together on this one in their own good time. 9. Reversal of transactions are covered in the new Insolvency legislation, you can’t intentionally transfer property to avoid creditors. 10. Of course, the big concern, and the first thing on my list (although last in this list) is that they won’t disclose how it works – the bit where the banks can’t go after you and they ‘remove the debt’. Well considered summary of the risks. Thank you. Glad ya dropped by Yoganmahew, and hoping that there aren’t actually as many people gone into this scheme as are claimed! Good work. Nice to see someone take up an interest in this type of chicanery. Good to see a post by someone who attended a presentation and heard their representations first hand. I’m not a trust law specialist but, on the basis of what you have relayed, this makes no sense from a legal point of view. What on earth do they mean by “only your folio number” goes into the trust? It has the hallmarks of something dressed up in legal terminology to fool people. For example, “creating a Court of Record in front of a Notary”. Again, this makes no sense. I am a trained notary public and have no idea what creating a Court of Record involves. Moreover, a notary should not be involved in a purely domestic transaction and has no role. Rather, it looks like they googled something and pasted together, randomly, a few phrases from American legal sources. I wonder if anyone has spoken to the Gardaí about this? Thanks for stopping by and commenting, I’m with you on the suspect nature of how it works (as can be seen in the post!). Just because something a notary does can/can’t be undone except by the Supreme court is – in my view – mixing up two very different things of jurisdiction and of validity. A voidable transaction doesn’t need to have a Supreme court ruling, it’s just void. Exactly. And the idea that something a notary public does cannot be undone by the Supreme Court is entirely false. Notaries are regulated by the Faculty of Notaries Public and the Chief Justice, they don’t have magical legal powers. But before you even get to that point, what they suggest the notary will do makes no sense! I advised a client last week to stay away from this. Also I think it is likely that the trust document and lease are unenforceable. If people are signing away property rights t the trust then they do need independent legal advice. I have seen the “private trust” deed and it is a copy and paste job from the universal community trust website. Google it and you will see pictures of stars and planets etc together with all manner of things relating to the freeman of the land movement. Also the 2009 conveyancing act prohibits transfers to avoid creditors and also leases of land subject to a mortgage require the consent of the bank otherwise they are void able. Also it is possible that the 999 year lease would equally be prohibited by ground rents legislation. I’m not sure what the agenda is here but I would definitely steer clear. I read what you say Karl and you sound like a man with a grudge or is working for the banks, I had a barrister look at this and he said it can work, but you views seem to suggest you know better. I just wonder have you a gripe over been unable to find out how it works in fear you will run to your bank buddies to tell all???? sounds to me that this could be the reason, as from what I was told about you, you seem to have a direct line to the banks and you have been known to “kiss and tell” for self gain. I think many people we relied on have left us down and now you are trying to blacken what is a very good idea in fear that people realise exactly how many so called professionals were colluding with banks against ordinary folks. If this trust saves one life or one family then great if not then we can rely on you and David Hall to solve the mortgage crises as you seem to be doing.!!!!!! maybe get behind the idea instead of knocking back what could be a life saver for many people or is this your way of getting on the TV to talk about “what you know and what you think” some actions from the likes of you would be more helpful rather then working with the banks or should i say your paymasters..
you sound like a man with a grudge or is working for the banks, I had a barrister look at this and he said it can work, but you views seem to suggest you know better. While we do often work ‘with’ the banks, we don’t work ‘for’ them, this is a common misconception, we work for our clients and only exist because of them. The people involved in this scheme constantly talk about ‘barristers opinion’ but they don’t name said barristers. Unlike your crew, I can name several who have said it’s nonsense such as Bill Holohan who actually wrote the book they teach bankruptcy with. have you a gripe over been unable to find out how it works in fear you will run to your bank buddies to tell all???? sounds to me that this could be the reason, as from what I was told about you, you seem to have a direct line to the banks and you have been known to “kiss and tell” for self gain. No gripe because I don’t know how it works, any more than I don’t avoid taking flights because I don’t know how an airplane works, this is the same ‘accusatory denial’ I met with at the meeting. If the plan works it should work even if the banks know how it’s done, the fact that people are giving over property and power of attorney without knowing what they are doing is suspect at best. I’m not sure what the ‘kiss and tell’ allusion is, and my relationships with banks is rather public, go to the bother of seeing what I say about them. Of course that’s the case, everybody is and always will be an innocent victim as long as you are willing to bend your world view around such little obstacles as reality and fact. Sadly I can’t ‘get behind an idea’ that sounds and appears to be a sham on the basis that it might ‘save one borrower’. I’d rather get behind solid and proper plans that save lots of borrowers. As for actions, again, please do your research, I have been showing people how to get back at the banks publicly and privately for years, the first guide on dealing with serious debt problems was penned by me (repossession guide for Irish Homeowners 2009). On that last point, again, do some f”£king research, on leases longer than 20 years the tenant is liable for the property tax, and last time I checked 999 is greater than 20. 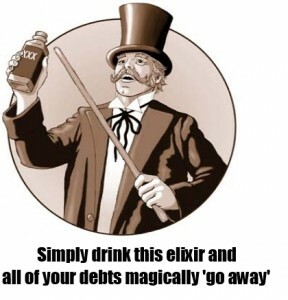 Good luck with the snake-oil sales, I just feel bad for the suckers that have been duped into thinking they are about to be saved. I was at the meeting and when you spoke we only realised it was you so we decided not to take part in the conversation you were asking the same question in several different ways and when they refused to tell you the legal plan to remove the debt you spat your dummy of of the pram like a spoiled brat. I noticed you never put that in your dribble you write or your TV interview, you showed a side at the meeting that was quite disturbing as you made it obvious you were on the banks side from the start. We spoke in private to one of them and found out information which was lost at the meeting over your antics, it was embarrassing to say the least, people attended the meeting to listen and make a conscious decision weather or not this avenue or opportunity was for them, yet you all you wanted to do was annoy the attendance with your smart comments and childish antics, why did you not do the honorable thing and tell people at the meeting you were attending as a journalist ? you sat their and took notes on private individuals personal circumstances just so you could go on TV and this blog to make noise.? shame on you for been so deceitful and disrespectful to us this is exactly the way banks work and you claim to be independent or what ever. I know exactly where your loyalty’s lie and its not with the mortgage holders in distress that’s for sure. And as for naming the barrister who I spoke to that’s my private business and not yours I like many like to keep our private business private and like many at the meeting who spoke after said you came with an agenda and helping people wasn’t it, and after reading your comments on the paper and watching you on TV I would have to warn people to be very wary before contacting you with their private affairs as someone who beds the bankers need to be avoided. Maybe if you were more honest and up front you would have achieved more from the meeting, I found it interesting and will make my own decision which wont include you dictatorship media(sorry banks) comments or in accurate views, after all we all know who pays the piper picks the tune. I don’t have to disclose why I go anywhere any more than you do, this country is free and disclosures are not mandatory. I was paid to attend as a hired financial advisor for another person who was thinking of doing this and wanted me to vet the idea. Your version of the meeting is a little different to mine, I didn’t speak at all for the entire duration of the presentation part, only after when they were taking questions, and when they opened the floor to questions I did ask a few. The reason for the repeated question from different angles is that at no stage did I get a reply that was an answer, I got deflections dressed up as answers in a fashion worthy of our most experienced politicians. Then there was the ‘oh you must love the banks’ line, which is not true, that is a trick used to shut a person up which is why I said (and it was a bit cringe I accept) that he was making an unfair assumption and not answering a direct question. Was that childish? I guess that depends on your world view, I would see it as responsible inquisition. Being sceptical of something is not the same as being on the other side of an argument, again, just because I think this is not a workable plan doesn’t mean I don’t think there are other alternatives. If you told me that eating bananas cures cancer I’d be sceptical, that doesn’t mean I think cancer is great or that I think other solutions like chemotherapy are crap, they are not connected things and yet this is the argument you repeat. Repetition is not a substitute for fact. And if you feel that I ‘spat out my dummy’ you can be damn sure that I was angry at the nonsense being spouted as ‘a cure’, semi-legal jargon dressed up as ‘fact’ and then no actual information on what happens at the end other than to just ‘trust us this works’? That you take any of that seriously leaves me in no doubt as to why so many people go from bad to worse financially. I’m sure they did give you all the secrets afterwards, and now you as the anointed secret hold will not share it, you’ll only say that you have the inside information. The only problem there being that other people who signed up didn’t get told any of this, and others interested were not told, so you must be amongst the few special ones worthy of this insider knowledge…. And yet for all of your talk of ‘saving lots of people’ you won’t share that information which only proves your own contradictory position. You aren’t interested in saving lots of people, other than yourself. Good luck in making your own decision, I’m sure it will lead to the outcome it warrants. If you send me €100 via paypal I’ll ensure you never have to pay another utility bill again. Obviously I can’t go into minute detail, trade secrets and all that. But if it makes you feel any better, I am willing to confirm that I have taken legal advice from a solicitor and he confirmed it is legitimate. I can’t give you his name, of course. Anyway, send on the €100 – best money you’ll ever spend. For anyone sceptical about this, you’re only a load of oul begrudgers, reluctant to see the common man get a break. I also have a range of anti-tax stickers, a holy statue that means you don’t have to pay the TV licence (read the constitution), and a cat named Pablo who gives excellent advice on how to escape inheritance tax. Good man Ronan great advice I can see like Karl you also have a paymaster. Did you go to university to learn that crap or did Karl teach you, Karl is a great man with long winded dribble to hide the fact you works for the banks or the banks interest much like you Ronan. Thanks for exposing your real intentions I’m sure Mr Bank will look after you well lads. of course… because the only alternative if you don’t believe in this makey-uppy thing is that you are either ‘for the banks’ or ‘against regular people’. As for my client, he was in trouble before he knew me. Send on the link to the ‘other site’ or is that a secret too? Can see that your arrogance ooooozing from your pours that’s exactly what people need, a pi** head know all who’s only way to disguise his ignorance arrogance is to insult and make a joke of a serious issue, can see now why you missed several valid points at the meeting, and people actually pay you for advice and attending meetings, its no wonder your client is is trouble if he is taking advice from you, are you on commission from the banks for every client you shaft (sorry) help. No wonder we have mortgage distress when the likes of you two are so called figure heads on mortgage advice christ help us, this just make we think that if the trust is that bad why are you so determined to trash it every chance you get !!!!!!!!! !, you see something in it that works and that makes you cringe at the thoughts that you will be outside the box not making commission?. I sent you comments onto another site and the reply’s are staggering regarding your professional behavior, hahaha give a fool enough rope and they always hang from it. I’m sure people will see through your game, but thanks for your free advice much appreciated just a pity you client cant see your posts could have saved himself a mortgage payment, because if he has half a brain we will see through you and realize exactly what your agenda is. I did notice you said you were paid for your services, you client is in financial trouble but you managed to help him find your money I’m sure.kettle calling the pot black. Vote for Karl Deeter for President of the Central Bank, he is half way in the door already. Look at it for this point of view, all the congregations of the Catholic church within Ireland have all done the exact same thing with their own property portfolios so as to ring fence them from potential seizure by the state over non payments of their share of the victim settlement funds. Some of the best legal minds on Trusts worked with them on this. Trust law is some of the most complex law there is. Now if you think that some of the people involve in this have not spread the knowledge you would be foolish to say the least. The congregations and the Vatican have invested millions in doing this right and in a bullet proof way. Knowledge is true power, plain and simple. Additionally there is an even bigger issue looming for the Irish banks and that is securitisation. There were no clauses in the mortgages to allow for securitisation, hence the banks broke very simple laws in relation to contract law by doing this. They involved 3rd parties without either getting the permission or knowledge of the primary party (the borrower). The law is a rule book, plain and simple. Yes there are things that we all accept that are wrong, for instance murder. But the laws in relation to contract and trust law are just a set of rules. If those rules exists they can be used to effect. But in relation to contract law in and securitisation the process is actually black or white. When a bank securitised a mortgage, it got paid the total sum by a 3rd party, so in effect they turned an asset into a liability, but they all have the debt on their books as assets and not as a liabilities. Technically it is only an asset as long as the borrower does not challenge the contract they have with the bank. If the borrower challenges the contract and finds the contract has been null and voided by the illegal actions of the banks then the debt is no longer an asset. One more thing on securitisation if the banks have been fully paid back by a third party, where did all the money go??? We know the above to be true, Bank of Ireland bought back €1.5 billion of securitised mortgages, why may you ask. I will tell you because they were instructed to do so by Wilbur Ross’s legal advisers. Who is Wilbur Ross some might ask, he is BOI’s single largest individual shareholder, he is an American who is probably one of the world’s top specialists in distressed debts. Now we move on to company law. Any company must carry the assets on their book at fair market value. If they have “misled” themselves on what assets they actually have they will have to initiate a massive accountancy write down exercise. Why do you think Ireland is being “FORCED” to do their bank stress tests 3 months before every other country in Europe, considering the fact that the Greeks, the Portuguese and the Cypriots are in a far worse situation that us officially. No its because the German government knows that it is Ireland who is the biggest basket case in all of Europe because of all the aforementioned issues. The banks have messed up big time and have been caught with their pants around their ankles, how do we know this, have a look at the contracts the banks are now issuing for mortgages. If there are no potential issues for the banks why change the contracts. As with all games the player who knows the rules the best is usually the one who wins. What has happened now is individuals have begun to understand how the those rules can be used to great effect. Additionally it does not matter one bit what happens at Irish court level, because everyone in Ireland can make the challenge at a European level. Contract law is somewhat universal, so in effect the banks haven’t a hope in hell. If we had simple done what the Icelandic’s did and write down everyone’s mortgage to 115% of current market value, we would have been able to issue new contracts where all these problems would go away. But no the “moral hazard” argument was used. In effect the actions of the banks have created such stress for individuals in this society of ours that these same individuals have had to learn the rules of engagement. The real issue we face now is this, the banks cannot cover their liabilities. If everyone in Ireland simple went to their bank and asked to transfer all their savings to the post office the banks would fail in an instant and Europe would not bail us out. The EU knows the full truth. What we have now is damage mitigation exercises nothing else. Karl I like listening to you when your are on TV, but on many issues here you are wrong. You have to understand that Ireland has one of the most complex legal systems in the world because it spans 100’s of years, we have so many ancient and obscure laws still on the books, plus on top of this we have precedents which have been set by common law. This all lends to a simple fact that there is so much previously unused laws and precedents out there that is is virtually impossible for legal professionals to counter the impending avalanche that is coming. What has happened is the crowd sourcing effect, there are more individuals crawling through our legal system than at any other time in the history of this country. The advise I am giving individuals is move all their currency accounts and if possible their pensions outside the country before the end of October. It pays to be prudent. It is my firm belief that after the new stress tests are done of the Irish banks we may well have a Cypriot solution forced on us. The German government is of the opinion that Ireland will need another bailout of at least €37 billion, the Irish government is spinning it at between €18 and €20 billion. Now who which government would any sane person believe, well I’ll tell you, you cannot believe a single utterance that the Irish government say. They are simply out of their depth. We have 3 teachers with no economic back ground running the finances of this country. It beggars belief. And to finish up the €37 billion has been indicated as a conservative figure, or is a best case scenario. In some circles they are throwing around the figure of €65-75 billion. All the cupboards in the banks and pensions funds in Ireland are bare. That is a plain and simple fact that everyone in the know outside Ireland realizes. I don’t agree with you John, I accept that there are trusts used by lots of organisations (charities, religious orders etc) but that isn’t what stopped remittance of damages, nor do I think that an appeal at EU level or common law tests will resolve something that is a fundamental contract issue where there are other laws with contingent recourse and perhaps precedence on the matter. That aside, I agree about our banks, they are in a very precarious position and things could well go bang at them yet. It pays to be prudent, I remember advising clients to take money out of Anglo in 08′ and their private banking dept were furious with me and denied they had any problems… the rest is history. Hi Ed where can one get in contact with this trust? I would be interested based on the comments I have read. The reason that the people who are involved in this Trust scheme won’t divulge its core workings is that as soon as they do the government can change the law to stop this loophole. As long as they keep their secret more people can join. 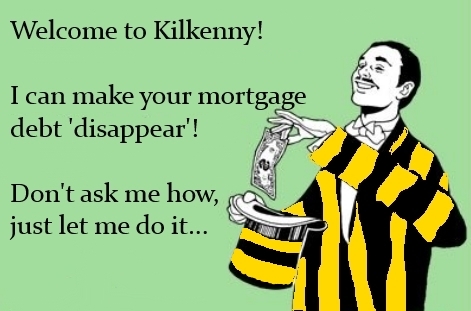 If its only cost €250 to join for a private individual with a home mortgage, its the best investment one can make. How much does one hour of your time cost Karl? Even if the whole scheme can be unwound the private individual is only down €250 and they essentially lose nothing else. But with the legal war chest they are building I would say if this is challenged it will be in the courts for years. So lets take worst case scenario, an individual pays €250, they were going to have their home repossessed, but now because they have joined this trust they get to stay in their home for a minimum of 1 year more. It the best rental deal there is. Its actually a no brainer. I would like to point out I have nothing to do with this scheme, however I do know a considerable bit on securitisation and contract law. In my opinion Ireland should just default, leave the Euro and the EU and become a member of the EEA, Switzerland and Norway are in the EEA. These are two of the wealthiest nation on the planet. There would little or extra cost to doing business because in modern banking any company can have whatever currency accounts they want plus we can change the law allowing for taxation of income arising from different currencies without having to repatriate Euro’s or Dollar’s into Irish Punts. What has been done to Irish society is horrendous, we have children going to school hungry. We have children in Irish schools who are so hungry they are asking other children to share their lunches with them. This is a fact that has been reported by that National Teachers association. This is not a small problem is a very large problem. All of this was caused by the banks, civil servants (regulator, central bank, department of finance) and our government. This was not caused by the citizens of this country. A few 100 men and women have destroyed our society. What did the children do wrong? Every property owner in this country that has done a so called deal with their banks i.e Interest only or less than interest only are put in a place called Death Row, its only a matter of time when their banks will tell them that their mortgage is un sustinable and that they will have to sell their properties and be liable for the ballance. Its time to stand together , I have put my property in Trust a few weeks back and for once in the last few years i feel relieved and i now know that i really own my home. Karl if you wanted to write about this you should have requested a private meeting with the information providers of the Trust. I agree with John and Jim R, the trust is not harming the private distressed mortgage holder but if the worsted thing it can achieve is to force the banks to sit down with you under “your terms” to agree a settlement, re structure, write-down or what ever you want or want to call it then €250 seems a small cost in the light of things. I think Karl jumped over the trust without really thinking this through, this is not a reflection on the chap but more a mirror image of what the banks and government has been doing to us by making decisions without really thinking the thing through to see if as in this case the Trust can help even a few sadly distressed home owners. how long will peoples properties have to remain in the trust and what is the procedure to get properties out of the trust if a person needs to sell ? If anybody would explain how it actually works or email documentation to info (at) mortgagebrokers (dot) ie then we’d be happy to reconsider our stance on the matter. I have a feeling there won’t be any information or explanation forthcoming. At the meeting it was clearly said that you can take out your property from the trust at your discretion its your trust no one else and you decide what when and where,this question was asked at the meeting. The trust is your trust no one else. They said between 4 months and 2 years before you have clear title and your deeds back. Not bad I suppose as I don’t see the point in giving away the house at this point so it looks like a runner for me. I have little or no choice, I owe more then its worth, cant sell to clear the mortgage,have a disaster of a wage, family to feed, no payment future the way things are going and I refuse to agree with what the banks want because I just don’t believe in what banks tell me is in my best interest of me or my family. The people I believed in have left me down and now I feel the system is so corrupt I cant rely on people that speak up for the banks or government. I went to New Beginnings and they just repeated what the banks told me so so much for that waste of time I came out thinking “They work for the banks or did I mishear the words, HAND BACK THE KEYS”. Just came across this website… while the rebuttal involving the tax advice needs redoing, that doesn’t take away from the fact that the proposed scheme seems to be right up there with that ‘freeman’ nonsense one occasionally hears of sometimes. I would advise all to stay well clear. Lawyer-up before engaging with anyone promoting these schemes! Check out the actual ‘trust document’ this is what peoples hope rests upon? looks like things are moving ! any update Ed Davy ? Having read all the comments made here I would like to put forward two points in favour of the trust. There are a lot of people in this country with properties in serious negative equity. In these cases the bank is going to take the property anyway so why not for a couple of hundred euros, put them into this trust on the very slight chance that it would succeed. If it does not succeed one is no worse off and if it does succeed – bingo. As is pointed out the promoters of this trust earn 10 to 50% of the assets placed in the trust – but they only ever get paid this money if the process succeeds. If it does not succeed there is no payment. If nothing else does this not illustrate a great belief in the process by the promoters. It would be much more of a scam if there were serious charges made upfront but this is not the case. A test case will be taken to the courts in the very near future and then we will discover if the promoters have in fact discovered a loophole that allows a lot of people to get rid of their debt. It is going to be an interesting autumn in the courts, dealing with the trust that currently has almost 3000 people with 2.75 billion in assets! Seriously? If it does not succeed “no payment”? 3,000 people at a minimum of €250 a head is quite the “no payment”. The promoters have put sweet f.a. into this themselves (Did they run an ad in the Indo?) so even if there is no foal, there’ll be a whopping great fee…. Tell me have things gone quiet on this whole thing? Has there been an update of the publican who was a member of the trust, got back into his pub after the receivers vacated it when challenged. Then, I understand, the receivers went to the High Court to get the removal of the publican and were successful. I also understand that there was no support from the Trust to the publican or his family at the High Court and the publican’s son was there to fend against the banks etc. Has there been any further developments anyone? As I wrote earlier on Clatter of the Law, it seems to me that this “trust” is likely to be deemed a conveyance intended to defraud creditors under s 74(3) of the Land and Conveyancing Reform Act 2009. If so, it would be “voidable”, at the instance of the affected creditor. Also will face same issue under provisions in new bankruptcy act, so there are several methods for reversing this. It would seem that there is some kind of claim under Brehon Law (saw it in one of the papers). Good luck to them using that as a precedent! has this died a death ,any update or any sucess stories ? Well done Karl, credit where its due, that was a well written and explained piece. Because of the debacle over Charlie Allen ive been trying to find out more about. 2. If there so great how come we havent heard of them. Needless to say answers to those questions quite a bit sketchy and elusive. I would agree with you Karl and say this is one best watched from the sidelines.